The Harlem Globetrotters at the KFC Yum! Center on January 20th | Louisville, Kentucky | Joe Hayden Real Estate Team - Your Real Estate Experts! The KFC Yum! Center has seen a lot of sports action lately, but on Sunday, January 20th at 2 p.m. basketball will reach a whole new level within its walls. The Harlem Globetrotters will be dribbling the court and dazzling the crowd at 1 Arena Plaza in Louisville with their athletic skills and slapstick comedy routines. This family-friendly event at the Yum! Center is happening this Sunday only, with ticket prices starting at $19. The theme of the show is "You Write the Rules" and the end result is the crowd gets to vote on their favorite moves or antics of the evening. A new rule will be added to the Globetrotters' season that will be determined by the fans. Despite their comedic antics, the Harlem Globetrotters are all skilled athletes that earned recognition for playing ball and having a positive attitude and influence. 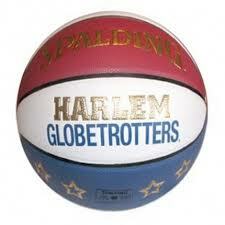 Since 1946 the Globetrotters have been running around the courts of the world entertaining families of all ages. The KFC Yum! Center may find that the team members have changed over the decades, but their wholesome play by plays have not. Today's Globetrotter stars are Special K Daley, Big Easy Lofton, Flight Time Lang and Dizzy Grant. Each will join the newest rookie members on the courts to give fans a show they won't soon forget.